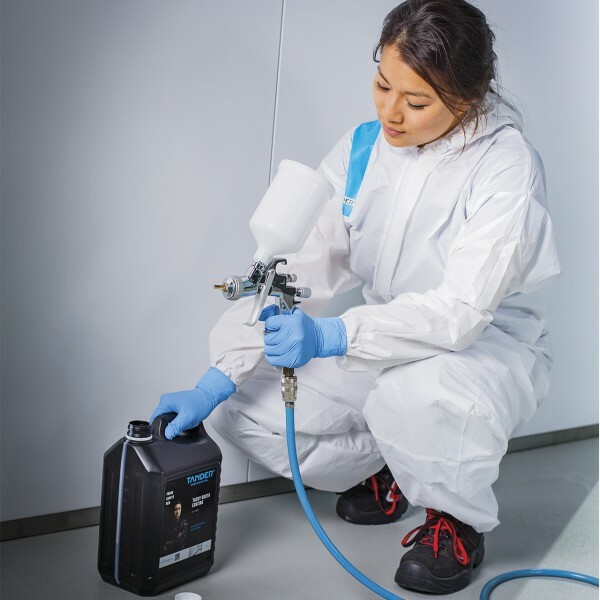 The best protection for your spray booth walls. The spray booth is the essential workplace for professional painters. Its walls deserve superior protection to guarantee a spotless end result. However, when also opting for cleaning convenience, you should choose Tander Tacky Booth Coating, which protects your walls from paint contamination and attracts dust and dirt before these can contaminate your paint job. The coating is easy to apply and remove after use. In short, quality work calls for Tander Tacky Booth Coating! Tander Tacky Booth Coating offers up to four weeks complete protection! Depending on how often you use your spray booth, Tander Tacky Booth Coating can be used for longer than the recommended four weeks. Easy to apply with a spray gun (1.8, 2.0), brush or roller. Can easily be removed with warm water or a pressure sprayer. Layers can be applied on top of each other. Protect from direct sunlight, store between 5 - 30°C. Shelf life 2 years when kept by a temperature between 5 - 30 degrees Celsius. How can I apply the Tacky Booth Coating? The Tacky Booth Coating can be applied by spray gun (1.8, 2.0) or with brush. How can I remove the Tacky Booth Coating? The Tacky Booth Coating can be removed with warm water or a high pressure gun. How often should I reapply the Tacky Booth Coating? We recommend to reapply the Tacky Booth Coating approximately every 4 weeks, with average use of the spray booth.